Corporate Team Building Packages (priced per bike by the hour) - The Raleigh Rickshaw Co.
Raleigh Rickshaw specializes in creating unique and fun group events for businesses, colleges, or other team building type activities. Our drivers have participated in group rides and corporate events using our rickshaws for everything from scavenger hunts around the downtown area to pub crawls and historic tours. If you want your employees to get to know each other in a fun and entertaining setting, a group rickshaw event is perfect! 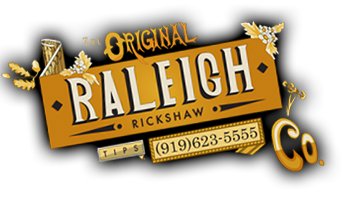 Group events and activities on Raleigh Rickshaws are the best way to build morale, bonding, or team building for large groups of people. Contact us today for pricing and details for group events. All packages will require a 10 person minimum. Our fleet is large enough to accommodate groups up to 60 people.